As 2015 comes hurtling to a close, I thought it might be fun and interesting to have a look at food and drink trends for 2016. Sales of processed and junk food appear to have peaked (2005) and continue to slide. A recent New York Times article analysing future trends reported a seismic shift in our culture away from processed food towards whole, real, fresh foods Consumer demands for natural and less processed food and drink are already forcing companies to remove artificial ingredients from their products and to replace them with more natural formulations. McDonald’s in the US responding to consumer pressure now plan use eggs sourced from cage-free hens and antibiotic free chicken. Joanna Blythman’s book Swallow This – Serving up the Food Industry’s Darkest Secrets has been hugely influential in informing the general public about what happens behind closed doors in food processing. Clean labels, climate change, concerns about waste and other natural phenomenon are also affecting the worldwide food supply. Sustainability is now a necessity for the bottom line and the common good. The growing emphasis on physical fitness and diet has spawned a whole new craze and market for ‘clean foods’, energy and sports drinks, vegetable juices, raw foods and food that supposedly make us ‘glow’ with good health. The Spiralizer (a gadget to make spaghetti from vegetables) and the Nutribullet are still selling like ‘hot cakes’ as the juice craze continues to endure. As food allergies and intolerances become more widespread (a symptom of how our food is produced to provide max yield at minimum cost) desperation grows, to find alternatives – non-dairy, non gluten and ‘free-from’ foods continue to gain more shelf space. Looks like ‘alternative’s’ could be set to become main stream. Do you have any allergies? is a standard question in restaurants. There are now 14 allergens that restaurants need to be aware of. The FSAI and Taste Council of Ireland added gravitas in May 2015 when they published guidelines for the Use of Food Marketing Terms. There also seems to be a growing realization that the quality of food and indeed drink from small production systems is generally quite different to that of large intensive enterprises. Hopefully this will prompt a growing appreciation of the quality produce from the family farms of Ireland. Our shopping habits are gradually changing – little, often, local…. On line shopping, apps that simplify online and mobile ordering and delivery services are beginning to have a real impact. Restaurateurs in the US and the UK are nervously watching the E-revolution and the trend of ‘home delivery’ and services like Munchery, who deliver restaurant quality food from a production kitchen to your door cutting out restaurants altogether. ‘Fine Dining is over’, sounds a bit dramatic but our eating habits have changed dramatically during the last decade. Casual restaurants and cafes offering fresh, seasonal, edgy food are’ jammers’ while many of the ‘starred’ establishments are finding it more difficult to fill. Small and shared plates are becoming a preferred way to eat. Food has shot to the top of the agenda in so many areas, TV food programmes like The Great British Bake Off and competitions like Masterchef are super popular ….Food supplements are guaranteed to boost newspaper and magazine sales .. ……. The rise of a ‘food centric media’ has apparently sparked a new interest in cooking. The number of food blogs has skyrocketed. For young people, its ‘cool to cook’ at home and share your creations via social media – it must be ‘good enough to tweet’. Food carts and food trucks have enabled many passionate young people to get started in the food business. Vegetables are at last beginning to move to the centre of the plate. The interest in ‘natural’ has boosted sales of ancient grains and super foods. There growing suspicion of tricky chemical concoctions has prompted a revival of interest in traditional and indigenous diets, ‘historical’ ingredients and food processing the ‘natural and old fashioned way’. Meanwhile, scientists have made huge strides in mapping our DNA and so we will see diets designed specifically for our personal genetic makeup in the not too distant future. Soylent, a meal replacement beverage, described as a ‘staple meal’, is now in production. My heart sinks at the thought of that being the future of food but obviously many investors have high hopes for this becoming a reality. Fat is shedding its ‘demonic image’ as the public gradually becomes aware of the lack of any research to link fat to cardio vascular disease. So we now see that butter is back and not just duck or goose fat but dripping and lard are also having their ‘moment’. And surprise, surprise we’ve rediscovered, not just how delicious but also how properly nutritious they are. Well done, to butcher Pat Whelan from Clonmel, Co Tipperary, for leading the revival of interest in dripping of which both my own mother and mother in law Myrtle Allen were always great proponents. Sugar is the new fat, although it takes time to change ingrained habits the impact is already being acutely felt. Sales of soft drinks and juices are plummeting and food manufactures are reducing sugar in their products or using alternative substitutes. Broths, particularly home broths are huge. Sales of almond milk have over taken from soya. Coconut products of all kinds both food and cosmetics are vaporizing off the shelves. The health benefits seem to be endless! Sugar substitutes, xylitol, agave, date syrup, honey, maple syrup….Be cautious, many of these may well be beneficial in their natural state but when highly processed……the jury is still out on whether they are better. Sales of avocados have had a huge boost from the raw and ‘clean food’ craze and are widely used in both sweet and savoury recipes – careful seek out organic avocados if at all possible. The popularity of kale still endures but cauliflower, cabbage and brussel sprouts have made a remarkable come back, thanks to the ‘healthy eating ‘brigade. Chefs have shown us how versatile they are. Roasted, shredded, spiced, on pizzas, in pilaffs….cauliflower rice is a terrific new discovery. 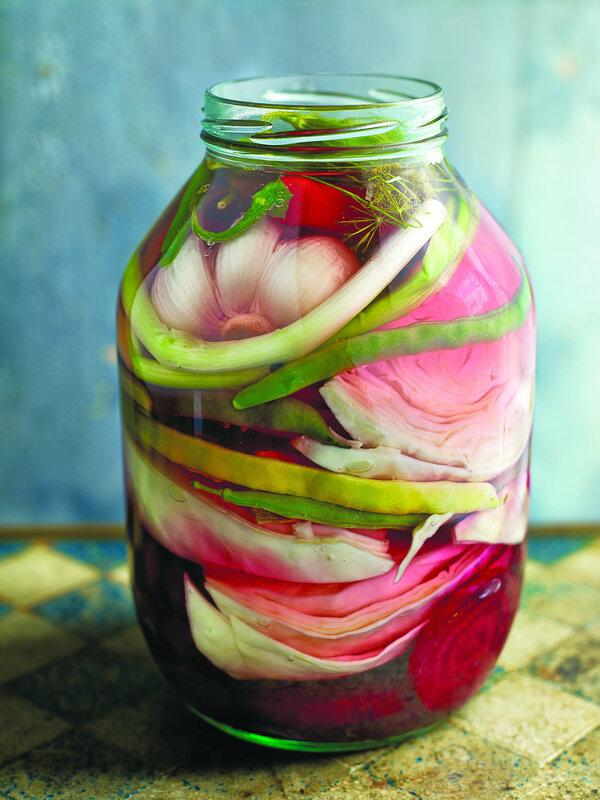 Who could have predicted that fermenting and pickling food would become the trendiest pastime in 2015? We now realize that the live probiotics in fermented and pickled food are enormously beneficial for our gut flora. Homemade, home churned, housemade butter and natural sourdough breads are now a regular feature of top restaurant menus. If you’d like to learn the simple secrets of how to make kimchi, sauerkraut, kombucha, kefir….you might want to consider one of the Fermentation Courses at the Ballymaloe Cookery School – see the website www.cookingisfun.ie – we’ve been running them since 2014. Whether for dietary or for medicinal reasons, there is a marked increase in the number of people avoiding dairy and gluten. The dairy industry need to be acutely aware that we mess with the quality of our dairy products at our peril…. Watch the rise in micro dairies mirror other areas where the consumer wants to know exactly how their product is produced and where. …. In-house Smoke Houses -smoking foods in restaurants and at home is a new party trick – everything from fish, meat, vegetables to chilli and even chocolate. See how to smoke in a biscuit box in Forgotten Skills, page 472, published by Kyle Books in 2009. Seaweed in everything, from beer to icecream. Raw fish – ceviche and tartare are becoming main stream. Bottarga and cured mullet roe are also gaining popularity. A myriad of miracle diets as desperation grows, vegan, paleo…volumetrics, iets…The popularity of the Meat Free Monday Movement has astounded many. Wild and Foraged foods is an enduring trend and using pebbles, seaweed, spruce shells …to serve food in as natural an environment as possible. As people gradually discover that campylobacter and salmonella is a given on intensely produced poultry, there is a dawning realization that we may now need to go back to the days when chicken was a rare treat but are we prepared to pay the €20-€25 euros it really costs to produce an excellent organic free range bird. There’s a lot more but enough ‘food for thought’ for today. House made sodas and homemade lemonades. Water kefir, kombucha and a variety of fermented drinks are making an appearance on supermarket shelves as their benefits for our gut flora are more widely understood. Sales of procesco and cava have outstripped champagne by more than 7/1/. Cocktails and mocktails have become even more exciting and creative. My Aunt Nina’s grandmother, Liza from Karabakh, used to make this using mountain spring water, and the taste of those pickles was incomparable. Beetroot is often added to Armenian pickles for colour, which is similar to how it is made in the Middle East. These pickles are delicious and we eat them in the summer and in winter. You can buy horseradish leaves and dill stalks in bunches from Polish delis specially for pickling, but if you can’t find them or the blackcurrant and cherry leaves, just substitute with some spices or aromatics that you like (celery would be great) or simply leave them out. Place the beetroot at the bottom of a warm, sterilized 2 litre (3½ pint) preserving jar, then top with the cabbage wedges, beans, spring onions, garlic and all the aromatics, apart from the peppercorns. 3 days to pickle, then store in the refrigerator. The beetroot will gradually turn everything a deep pink. It should keep unopened for several months. 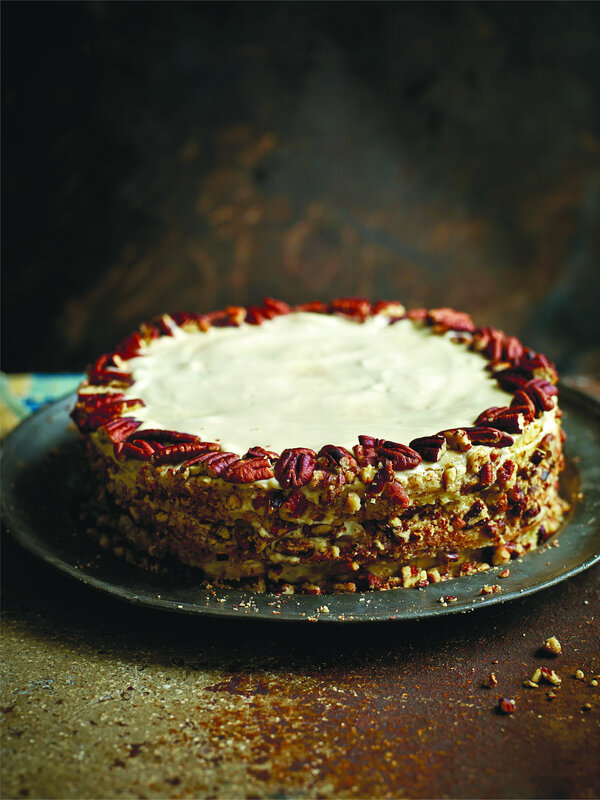 This is for honey lovers who are not scared of weird cake making methods. You can use a good-quality crème fraîche to make the icing, but what you are looking for here is a beautiful balance between slightly sour and honeycomb sweet. Preheat the oven to 180°C/350°F/Gas Mark 4, and lightly butter 4 x 24cm (9½ inch) cake tins (or use 2 in batches). Mix the eggs, butter, sugar and honey together in a large heatproof bowl and place it over a small saucepan of simmering water. Give it a stir, to help the butter to melt, then whisk with an electric whisk until the mixture becomes warm and fluffy. Let it cool. Place the bicarbonate of soda in a cup and pour the vinegar over the soda, then tip the foaming mixture into the honey mixture and give it a vigorous stir. Gradually fold in the flour to form a thick but fluid batter. Spoon one-quarter of the mixture into each prepared cake tin and bake for 15 minutes or until deep golden. The sponges will still be soft while warm, so let them cool before taking them out of their tins. half the cream to sandwich the 4 sponge layers together, then use the remaining cream to cover the top and sides. Decorate the sides with the crushed nuts. Use the pecan halves to decorate the top of the cake. Alternatively, crush all the nuts and sprinkle them evenly all over. These are three quick and easy dips that I keep in my fridge on rotation. They are great for boosting quick meals and for quickly slathering on sandwiches. But more than anything, these are what I snack on. I dip cracker or a carrot into whichever of these happens to be in the fridge. With these in my kitchen my 4pm raid of the biscuit tin is often avoided. Bash the garlic and put into a small pan with the rinsed lentils. Cover with cold water and cook the lentils until tender and mashable, then drain and remove the skins of the garlic. Blitz the lot until whipped and smooth, add all the other ingredients and blitz again. Top with toasted seeds and the herbs. Blitz the beetroots, dates, yoghurt and half the bunch of dill with the zest and juice of the lemon and the oil, and season well with salt and pepper. Throw in the toasted walnuts and blitz again, keeping a bit of texture if you like; I like mine smooth. into a bowl. Finely chop the green chillies, zest of both limes, and add both to the bowl, along with the juice of one of the limes. Season well with salt and pepper. Drain the peas and mash well, then add them to the herbs. Grate over the coconut cream and mix well. flatbreads if you are hungry. Bear in mind that if you use brown rice it will take about 20 minutes to cook. Fill and boil a kettle and get all your ingredients and a large frying pan together. Cook the rice in a small saucepan of boiling salted water until cooked – this will take 10–15 minutes. Meanwhile, pull the kale from its stems and shred the leaves with a knife or tear into small pieces with your hands. Put the leaves into a bowl, then add the zest and juice of the lemon and a good pinch of salt and scrunch it in your hands for a minute to break it down a little. Chop the spring onions finely and add them to the bowl. Once the rice is cooked, drain it well. Put a large frying pan on the heat and when it’s hot, add the rice with no oil and dry-fry for a couple of minutes to get rid of any moisture. Remove the rice from the pan, then put the pan back on the heat, add half the coconut oil at a time and fry the rice in two batches until starting to turn lightly brown and really crispy. Drain on kitchen paper and sprinkle with salt. a screw top jar with the sumac, if using, and 2 tablespoons of olive oil, add the honey and a pinch of salt and pepper. Put on the lid and shake to combine. De-stone and roughly chop the dates and add to the kale. Once the rice is almost cool, add it to the kale and toss in the dressing. Something magical happens to a cauliflower when you roast it. I usually turn to Indian spices when I think of cauliflower, but one bright May Day I turned to the sunshine warmth of saffron. My bay tree was in full bloom and so this mellow but cheerfully favoured vegetable found its way into my oven. I throw in a handful of golden raisins for some sweetness and some almonds for crunch. Leftovers are delicious stirred through pasta with a little extra olive oil – conchiglie (shells) work well. I love the sight of a cauliflower – it’s a pretty vegetable to me, with its milky curds wrapped in pale leaves and the tiny little green leaves that cling to the sides in an act of complete protection. Keep those little leaves on – they are bright and tasty and look so pretty. If you can get your hands on a coloured cauliflower (vivid purple and orange are my favourites), then you’ve got added antioxidants too and your dinner will be fluoro. I make this with spiky Romanesco, too, when it’s about – its pale green looks amazing against the saffron. Preheat your oven to 200°C/180°F/gas 6. Put the saffron into a little bowl, cover it with a couple of teaspoons of boiling water and leave it to steep. Get a large deep baking tray, throw in the cauliflower, onions, chilli flakes and bay leaves, and season with salt and pepper. Once the saffron has steeped, pour in the saffron strands and their liquid, add the raisins and almonds, toss everything together, then cover the lot with foil and bake in the oven for 20 minutes. Remove the foil and bake for a further 10–15 minutes, until the tips are burnished and the cauliflower is tender to the bite. Toss through the chopped parsley and serve.